HPI: 75 y F unknown past medical history, history limited due to language barrier (speaks French Creole), presents complaining of abdominal pain for unknown amount of time (patient points to abdomen as site of pain). 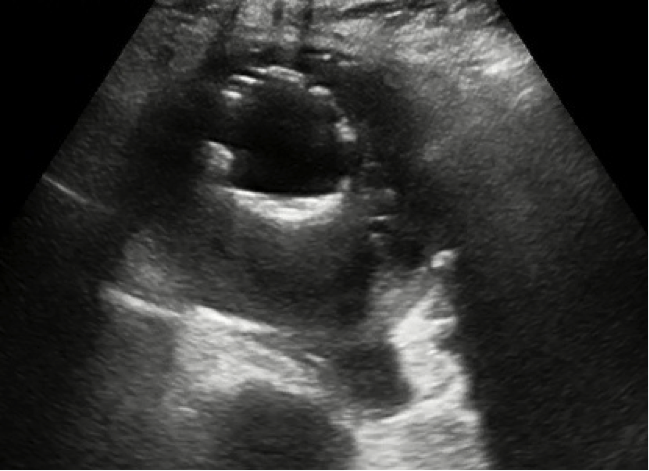 What ultrasound exam can aid the emergency physician in diagnosing patients with hypotension? Image 1 was obtained with curvilinear probe on Abdomen. What is the object featured in image? With color flow, Image 2 was obtained. Is there anything abnormal? What is this patient’s diagnosis? No, aorta enlarged with endovascular hyperechoic structure (metal stent). Yes, there is flow below the vessel. Leaking abdominal aortic aneurysm post endovascular repair.